Scratched by a cat? Acme Canine is Spike’s favorite canine resource! As a dog, I trust my owner to know what to do when I get into sticky situations like this. Even though I can chase a tennis ball like nobody’s business, my paws are too big to use the phone if I ever need to get professional dog advice. That’s why I’m glad my owner founded Acme Canine. 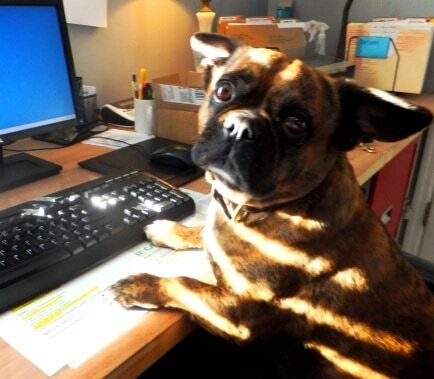 Whenever you get yourself into trouble, your owner can contact the canine resource offered by Acme Canine. The folks at Acme Canine know exactly what to do to help me control my instincts to chase cats. They have the perfect advice to keep you from getting hurt from eating rawhide. Owners of dogs like me are free to contact us at Acme Canine for help on any dog-related issue. 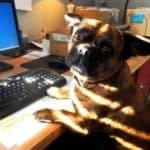 If your paws are too big to effectively use a phone, feel free to sign up for The Bark, our monthly e-newsletter, or visit my blog, Spike’s Dog Blog. Every few days, I share what’s been going on in my doggy mind and provide information on important dog topics. Ever wonder what’s happening in the dog world? Visit Spike’s Dog Blog and find out! I’ve got to go catch a frisbee in my mouth right now, so until next time, adios from the dog world! ARF! This entry was posted in Dog Care and tagged dog training advice. Bookmark the permalink.